Finally is a Slovak jazz-funk band formed in Bratislava, Slovakia, in 2002, founded by Eugen Botos (piano) – leader and composer of the band, Robert Vizvari (bass guitar), Martin Koleda (guitar). Finally and guests is a project of young passionate musicians, who were brought up on jazz, jazz funk and smooth jazz music (to include Stevie Wonder, Herbie Hancock, Chick Corea…). The genre of their music could be characterized as a harder style of Chick Corea’s Electric Band or Mark King’s Level 42 influenced by smooth jazz, hip hop, modern jazz, funk and ethno. Finally and Eric Marienthal had a series of performances in Japan and peaked at Bratislava Jazz Days (one of the top jazz festivals in Europe), where they performed with great success with Eric Marienthal. They started cooperating on stage in 2008, Finally has become Eric’s band for European concerts. These performances moved them forward to finishing their CD called My Space, at least 2 songs (Manhattan, My Space) are often played in American and Japanese smooth jazz/jazz radios. This formation – Finally and Eric Marienthal is going to be further presented in Europe. The members of the group were brought up in traditional musical families; each of them has a university degree in music. They are multi-instrumentalists and passionate performers of classical music as well. They are European top artists in their genre. Finally and their music can be definitely seen as a new fresh and innovating energy in the jazz genre. Final Definition is their second album after their debut album My Space (2010) and now available at their website. The guest musicians are Marcus Miller, Dave Weckl, Eric Marienthal, Victor Wooten, Jeff Lorber and more. Please write an email to finallycd@gmail.com Your name, quantity and an address is fine. The price is 30.-Eur + shipping! Jazz Head Entertainment is back again with their sophomore release Paradise. They send you on a trip around the world and back with a tasteful infusion of jazz, R&B and funk. So take a seat, sit back and relax while they take you on this musical journey. The journey starts at CDBaby. Sean Uliasz is a 24 year-old contemporary jazz pianist/keyboardist, composer, and producer from Southwick, Massachusetts. Sean has had a great deal of performance experience in both Jazz and Classical settings. Most recently, he performed as a first place winner for the Crescendo International Piano Competition at Carnegie Hall in New York City. Sean has performed with his band at numerous venues throughout Connecticut and Massachusetts, including Mohegan Sun, The Cambridge House Brew Pub, Luxe Burger Bar, and the Windsor Arts Center. His first album (EP) is Electrify and now available at CDBaby. Jazzmatics Vol. 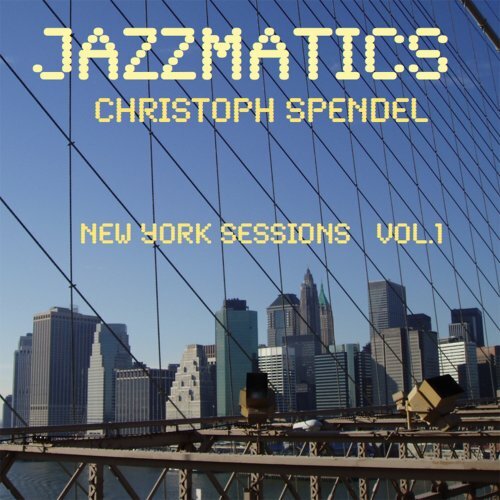 1 New York Sessions is the first album in the Jazzmatics series by jazz genius Christoph Spendel. The addition New York Sessions is explained by the fact that Christoph Spendel recorded these pieces during his stay in the USA in the 90’s. Christoph was supported by top notch musicians, with whom he performed on many events in the years 1993 – 1994. The album starts with the powerful City Life, described by Spendel with mighty keystrokes. Near the epicenter of fusion jazz he is also toying with other formats. Backed on a precise and snappy percussion rhythm Christoph exercises on Strong People the noble art of piano driven jazz. From the Past allures with elevated pristine synth sounds in opposition to a stroke of piano genius. During the summer, as vocalist Anna Danes planned the marketing and promotional aspects of her new album, Find Your Wings (DLG Records, 2016), she learned that she has breast cancer. She penned a motivational blog, Cancer Part 1: Vanity Saved My Life, to educate and inspire others who are dealing with their own health challenges. “I Will Wait for You” has a moderate, finger-snapping, toe-tapping pace. Danes opens with a haunting chant before delving into the lyrics. She sings of a lover whose gone away for some purpose not mentioned in the song. What matters is that she’ll is patient, longing for his return. Ruttenberg complements with fills underneath her lead, as well as a middle solo. Ferraro and Henry are steady throughout, with the pair coming out more during the instrumental fade. This project is a “coming home” so to speak musically connecting the many threads and styles that make up Shamik Jones‘ musicality. You can hear the influences but also a distinctness that is his own. This being Shamik’s second instrumental project is also exibits his growth musically as we explore his “roots”. We invite you on this instrumental journey which is a rediscovery of a musician and also a tribute to those who inspired and mentored him. It’s literally Hands On as Shamik has written, produced and played everything. It’s something He’s excited to share with you. You will hear the many musical influences like gospel, pop, jazz and others on this project. It’s a musical tapestry making this instrumental journey a collage of styles. Get it at CDBaby. This CD is dedicated in memory of Billy’s brother in law “Tony Dozier” whom he affectionately called “Tony D”. The music is big and boomy with that Detroit bass in the face, those Chicago horn hits, Washington Gogo beats and pulsing rhythms that carry the music along. Songs bring to mind the funk of James Brown and the groove of Earth, Wind and Fire, while exciting the audience with the energy of rock & roll. The Caught up show is a live 15 piece R&B / Jazz band, delivering an exciting and transporting experience blending funk, rock, Gospel, Soul and faith. Rain Down on Me is your choice at CDBaby.